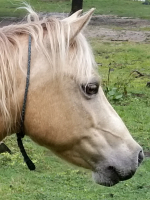 LP Kreature Feature H (Jewel’s Kreation x Little Jim’s Silver Bell) – 2009 silver buckskin shetland gelding. Color tested – Ee, Aa, Zn, CrN. Heterozygous black, 1 agouti, 1 silver, 1 cream. 42″ tall. Kreature was bred by Henry & Liz Siemers of Iowa and arrived home to LP Painted Ponys (Lillington) on 21 September 2009. We were told over the phone when we purchased Bell that she had a filly. Well, the creature that came with her was a colt. We stayed with the “K” line names and he became “Kreature Feature” – not sure if it fits but we sure have liked our guy. He was started in ground driving by Sierra Hoffman as a yearling in 2010, then went to Vicki at Pampered Pets Pharm in 2011, where he continued his driving education. Kreature now drives single to a cart, logs both single and as a pair and pairs up to pull farm equipment. 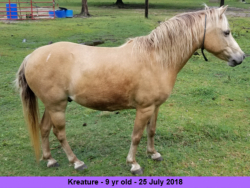 Kreature has returned to LP Painted Ponys in July 2018 and will be finished as a riding pony and be ridden by the grands and some of the neighbor children. 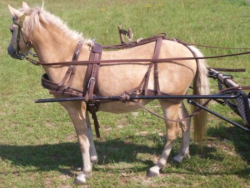 He will continue as a harness pony as well.